Library picture. From a previous Bil’in raid on the 15th of April. 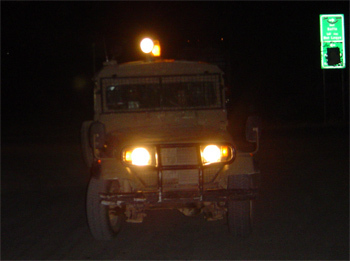 At 2:00 a.m. last night, while we were staying in the town of Bil’in, we were awoken and informed that the Israeli army had come into the village. We were asked if we could accompany members of the Popular Committee of Bil’in and others as they followed the soldiers through town. 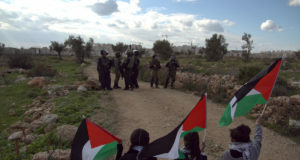 A few of us joined a cameraman and others in a part of the village where the IDF were surrounding a family’s home. The IDF eventually detained one man and witnesses say they used him as a human shield in order to find one of his family members that was believed to be in another part of the village. The Israeli High Court ruled in October 2005 that it was illegal for the IDF to use Palestinian civilians during military actions. The decision was made on a petition that Israeli group B’Tselem and six other human rights organizations filed in 2002. Since then the Israeli military has argued against the ruling and continued the practice, ignoring the Israeli High Court. Meanwhile, at another family’s home other international Human Rights Workers witnessed a man being arrested. The man was blindfolded and dressed in an orange prison uniform. The Israeli military had more than five soldiers standing around the front of his home and a number of others sitting in four jeeps (there were seven jeeps in total inside Bil’in). This lasted for over two hours. At one point, a soldier came up to a Palestinian and pointed his gun at him and said, “If you follow us, I will kill you.” They finally left the home and we followed the jeeps until we hit the middle of town. The people of the town had put up barricades in the road with large rocks and burning debris to put up a resistance to the invasion of their village. As the jeeps were rolling through town, the young men threw stones. The Israeli military fired rubber bullets and used sound bombs numerous times throughout the night. Finally, as the last jeep was exiting the center of the village at 6am, someone threw a molotov cocktail at the side of the military jeep creating a burst of flames with no visible damage. As we were writing this report the man that was arrested had not been released. 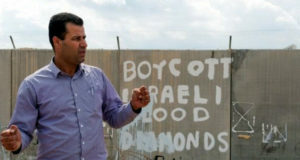 He is father of three, 29-year old Ahmad Katib, the brother of Mohammed Katib, one of the organisers of the weekly non-violent demonstrations against the apartheid barrier in the village. 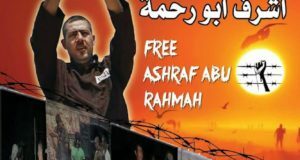 Abdullah Abu-Rahme, also from the Popular Committee Against the Wall and Settlements said that another villager, Ayad Burnat, was being held hostage in order to pressure the family into “giving up” his brother Mujahid who they want to get hold of for reasons that were unclear.